Rising at 200 meters above sea level on a sort of natural terrace on Mount Tauro, alongside the coastline between Messina and Catania, Taormina is one of the most famous destinations of Sicily and Italy. Its splendid panoramic position offers an enchanting view over a fascinating landscape: verdant mountains and parks, the turquoise water of the Naxos bay (just below the town), the majestic Mount Etna in the background and the Ionian coast, as far as the eye can see. Taormina is an ancient town, but after it became the favourite tourist destination for many European nobles and artists in the 19th century, in the 1900s it became famous all over the world as the most glamourous towns in Sicily, a great place to spend the holidays for the Golden Age movie stars. Thanks to its aura of style and elegance this is one of the locations we chose for our luxury villas in Sicily. The hamlet of Taormina was founded by the Greeks, and has always been a florid and wealthy centre; its fame arose during the Nineteenth Century, when great philosophers and artists such as J. W. Goethe travelled all the way from Germany, France or England to admire the wonders of this charming destination. Taormina is a true pearl: immersed in a lush environment, its little alleys are sided by elegant houses with wrought-iron balconies overwhelmed with colourful flowers, and plenty of peaceful points of observation provide breath-taking overlooks. The streets of the town are rich in pretty boutiques and refined cafés, as well as prestigious and invaluable historical monuments and landmarks: the most famous is the ancient theatre, still remarkably well-preserved and located within an outstanding panoramic setting. The view from the theatre is unforgettable, with the Ionian Sea and shore and Mount Etna in the background, and it still houses plays, shows and the annual Taormina Film Festival, the most glamorous event of the year. Other remarkable monuments include Palazzo Corvaja, built back in the 10th Century, and the city dome. The atmosphere is really fascinating: pretty elegant streets, stylish boutiques, the scent of orange blossoms and the jaw-dropping panorama make this lovely destination one of the most exclusive of Italy. The hamlet can be accessed by car as well as by aerial tramway. 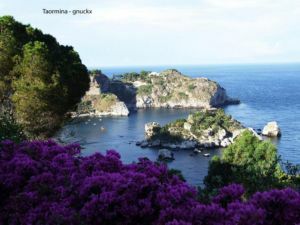 Just a few minutes far from Taormina lies the “Pearl of the Ionian Sea”, as the locals use to call Isolabella, a tiny island connected to the mainland by a narrow path, often covered by tidal waves. The little bay where the island is set is all part of a nature reserve protected by the WWF, and a day at the beach here is an absolute delight. A sandy beach can be found in Giardini Naxos as well, a popular seaside resort at the foot of Taormina. Another lovely hamlet is located near Taormina – a perfect destination for an excursion from the town: Castelmola, perched on top of a mountain overhanging the Ionian Sea. Its elegant main square, Piazza Sant’Antonio, paved with lava-stone mosaic tiles and surrounded by pretty sidewalks with stone benches, is a wonderful point of observation over Taormina and the Isolabella and Giardini Naxos bay. Such a panorama will be best enjoyed while savouring the delicious specialty of this tiny hamlet: almond wine, best tasted at the picturesque San Giorgio café, founded in the 18th Century. Waking up in one of our Taormina villas, tasting a brioche with “granita” for breakfast in the city centre of Taormina, swimming at Isolabella and then ending the day sipping a glass of almond wine at San Giorgio’s in Castelmola: a delicious taste of Sicily indeed!